We LOVE our job and love what we do, but one of the greatest joys we have is when we get to be part of the public confession of faith in baptisms. I have had the privilege of doing baptisms in many different environments from my own bathtub, to pools, the Nile River, & hot tubs, and it is always an amazing celebration. Though, I have to say my favorite place to do it is in the ocean with waves pouring in. It just such an awesome environment with people gathering around and taking part in the celebration. This week, after finishing up the week teaching on a Discipleship Training School, we had the privilege again to join in celebrating with three of the students. 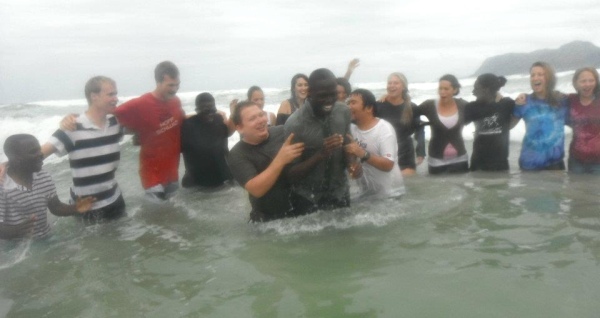 This picture is me and a good friend Virmz, baptizing Roland, who is from Uganda. I keep praising God every time I see this photo! I just got back from an amazing time in Nigeria working with former militants who had just come to YWAM. I had an incredible time. You can read about what God is doing in the newsletter we wrote by clicking here and downloading the PDF. We just got back from a House Warming dinner with Jeremiah & Hope to celebrate their new home. Thank you so much to all of you who gave to help make it happen. We can’t express the joy they felt as they moved in and they wanted to say, “Thank you!” to all who have helped make it possible. Here is a short video of their new place. Pastor Jeremiah, a former student of ours, & his wife Hope are expecting their first child in a few months, but are currently living in the church office in a township nearby which is a 10 X 8 foot concrete room with little privacy. The church has a shipping container and an old shack outside as you can see from the photo, and we have a team of our Bible Students who will be going next week to help turn the shack into a home. Would you consider helping us raise the $750 dollars needed in materials to make it happen? Click here to read more and watch the video below to see what we would like to fix up. We recently saw our last group of Bible school graduates finish up their ministry time as many of them have spent the last 2 months working in a nearby township training pastors and leaders. It was so exciting to hear all the stories of what God did in and through them during that time. But what was even cooler, was to hear directly from the pastors themselves. Here is a short video that was put together by the leaders of the outreach showing the response of some of the pastors to receiving the training of our graduates. Please take a look and be blessed! If you can’t see the video click here to watch it. The wedding has come and gone and we are so excited to be Mr. and Mrs. Lunn!! It was the perfect day, beautiful, intimate and so special, we couldn’t have asked for more! And we were blessed to have so many family and friends share in our celebration. The honeymoon was equally amazing and we came back so refreshed. We also had a wonderful reception in Seattle and were delighted to see almost 100 of James’ friends turn up to celebrate our marriage and send us off. Click on the picture above to see more of our wedding photos and check out our short wedding video below. Thank you to all who made our celebrations so special! The move to South Africa is just a couple days away! We fly out June 3rd. We’ve found our apartment – it’s close to the YWAM facility, in the same complex as other friends and just perfect for us. We’re looking forward to making South Africa our home, settling in and starting life together there. Here is a short video we put together of the work we have been doing in Africa.